A leaf is an organ of a vascular plant and is the principal lateral appendage of the stem. The leaves and stem together form the shoot. Leaves are collectively referred to as foliage, as in “autumn foliage”. A structurally complete leaf of an angiosperm consists of a petiole (leaf stalk), a lamina (leaf blade), and stipules (small structures located to either side of the base of the petiole). Not every species produces leaves with all of these structural components. Stipules may be conspicuous (e.g. beans and roses), soon falling or otherwise not obvious as in Moraceae or absent altogether as in the Magnoliaceae. A petiole may be absent, or the blade may not be laminar (flattened). The tremendous variety shown in leaf structure (anatomy) from species to species is presented in detail below under morphology. The petiole mechanically links the leaf to the plant and provides the route for transfer of water and sugars to and from the leaf. The lamina is typically the location of the majority of photosynthesis. The upper (adaxial) angle between a leaf and a stem is known as the axil of the leaf. It is often the location of a bud. Structures located there are called “axillary”. The term, distichous, literally means two rows. Leaves in this arrangement may be alternate or opposite in their attachment. The term, 2-ranked, is equivalent. The terms, tristichous and tetrastichous, are sometimes encountered. For example, the “leaves” (actually microphylls) of most species of Selaginella are tetrastichous, but not decussate. A stipule, present on the leaves of many dicotyledons, is an appendage on each side at the base of the petiole, resembling a small leaf. 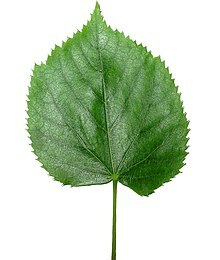 Stipules may be lasting and not be shed (a stipulate leaf, such as in roses and beans), or be shed as the leaf expands, leaving a stipule scar on the twig (an exstipulate leaf). The situation, arrangement, and structure of the stipules is called the “stipulation”. Veins (sometimes referred to as nerves) constitute one of the more visible leaf traits or characteristics. The veins in a leaf represent the vascular structure of the organ, extending into the leaf via the petiole and provide transportation of water and nutrients between leaf and stem, and play a crucial role in the maintenance of leaf water status and photosynthetic capacity.They also play a role in the mechanical support of the leaf. 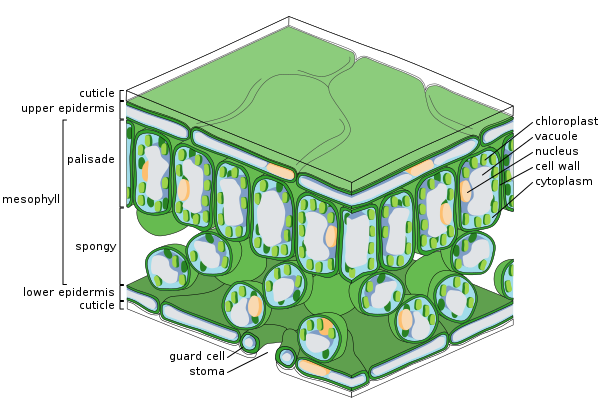 Within the lamina of the leaf, while some vascular plants possess only a single vein, in most this vasculature generally divides (ramifies) according to a variety of patterns (venation) and form cylindrical bundles, usually lying in the median plane of the mesophyll, between the two layers of epidermis. This pattern is often specific to taxa, and of which angiosperms possess two main types, parallel and reticulate (net like). In general, parallel venation is typical of monocots, while reticulate is more typical of eudicots and magnoliids (“dicots“), though there are many exceptions. The vein or veins entering the leaf from the petiole are called primary or first order veins. The veins branching from these are secondary or second order veins. These primary and secondary veins are considered major veins or lower order veins, though some authors include third order. Each subsequent branching is sequentially numbered, and these are the higher order veins, each branching being associated with a narrower vein diameter. In parallel veined leaves, the primary veins run parallel and equidistant to each other for most of the length of the leaf and then converge or fuse (anastomose) towards the apex. Usually many smaller minor veins interconnect these primary veins, but may terminate with very fine vein endings in the mesophyll. Minor veins are more typical of angiosperms, which may have as many as four higher orders. In contrast, leaves with reticulate venation there is a single (sometimes more) primary vein in the centre of the leaf, referred to as the midrib or costa and is continuous with the vasculature of the petiole more proximally. The midrib then branches to a number of smaller secondary veins, also known as second order veins, that extend toward the leaf margins. These often terminate in a hydathode, a secretory organ, at the margin. In turn, smaller veins branch from the secondary veins, known as tertiary or third order (or higher order) veins, forming a dense reticulate pattern. The areas or islands of mesophyll lying between the higher order veins, are called areoles. Some of the smallest veins (veinlets) may have their endings in the areoles, a process known as areolation. These minor veins act as the sites of exchange between the mesophyll and the plant’s vascular system. Thus minor veins collect the products of photosynthesis (photosynthate) from the cells where it takes place, while major veins are responsible for its transport outside of the leaf. At the same time water is being transported in the opposite direction. In evolutionary terms, early emerging taxa tend to have dichotomous branching with reticulate systems emerging later. Veins appeared in the Permian period (299–252 mya), prior to the appearance of angiosperms in the Triassic (252–201 mya), during which vein hierarchy appeared enabling higher function, larger leaf size and adaption to a wider vaiety of climatic conditions. Although it is the more complex pattern, branching veins appear to be plesiomorphic and in some form were present in ancient seed plants as long as 250 million years ago. A pseudo-reticulate venation that is actually a highly modified penniparallel one is an autapomorphy of some Melanthiaceae, which are monocots; e.g., Paris quadrifolia (True-lover’s Knot). In leaves with reticulate venation, veins form a scaffolding matrix imparting mechanical rigidity to leaves. The epidermis is the outer layer of cells covering the leaf. It is covered with a waxy cuticle which is impermeable to liquid water and water vapor and forms the boundary separating the plant’s inner cells from the external world. The cuticle is in some cases thinner on the lower epidermis than on the upper epidermis, and is generally thicker on leaves from dry climates as compared with those from wet climates. The epidermis serves several functions: protection against water loss by way of transpiration, regulation of gas exchange and secretion of metabolic compounds. Most leaves show dorsoventral anatomy: The upper (adaxial) and lower (abaxial) surfaces have somewhat different construction and may serve different functions. Most of the interior of the leaf between the upper and lower layers of epidermis is a parenchyma (ground tissue) or chlorenchyma tissue called the mesophyll (Greek for “middle leaf”). This assimilation tissue is the primary location of photosynthesis in the plant. The products of photosynthesis are called “assimilates”. Both leaf blade and petiole structure influence the leaf’s response to forces such as wind, allowing a degree of repositioning to minimise drag and damage, as opposed to resistance. Leaf movement like this may also increase turbulence of the air close to the surface of the leaf, which thins the boundary layer of air immediately adjacent to the surface, increasing the capacity for gas and heat exchange, as well as photosynthesis. 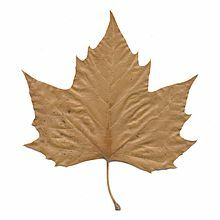 Strong wind forces may result in diminished leaf number and surface area, which while reducing drag, involves a trade off of also reduces photosynthesis. Thus, leaf design may involve compromise between carbon gain, thermoregulation and water loss on the one hand, and the cost of sustaining both static and dynamic loads. In vascular plants, perpendicular forces are spread over a larger area and are relatively flexible in both bending and torsion, enabling elastic deforming without damage. Many leaves rely on hydrostatic support arranged around a skeleton of vascular tissue for their strength, which depends on maintaining leaf water status. Both the mechanics and architecture of the leaf reflect the need for transportation and support. Read and Stokes (2006) consider two basic models, the “hydrostatic” and “I-beam leaf” form (see Fig 1). Hydrostatic leaves such as in Prostanthera lasianthos are large and thin, and may involve the need for multiple leaves rather single large leaves because of the amount of veins needed to support the periphery of large leaves. But large leaf size favours efficiency in photosynthesis and water conservation, involving further trade offs. On the other hand, I-beam leaves such as Banksia marginata involve specialised structures to stiffen them. 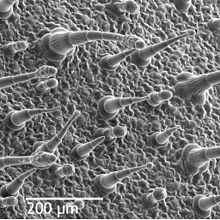 These I-beams are formed from bundle sheath extensions of sclerenchyma meeting stiffened sub-epidermal layers. This shifts the balance from reliance on hydrostatic pressure to structural support, an obvious advantage where water is relatively scarce. Long narrow leaves bend more easily than ovate leaf blades of the same area. Monocots typically have such linear leaves that maximise surface area while minimising self-shading. In these a high proportion of longitudinal main veins provide additional support. “Hairs” on plants are properly called trichomes. Leaves can show several degrees of hairiness. The meaning of several of the following terms can overlap. The veins arise pinnately (feather like) from a single primary vein (mid-vein) and subdivide into secondary veinlets, known as higher order veins. These, in turn, form a complicated network. This type of venation is typical for (but by no means limited to) “dicotyledons” (non monocotyledon angiosperms). E.g., Ostrya. although criticized as being unduly burdened with jargon. Veins sunken below the surface, resulting in a rounded channel. Sometimes confused with “guttered” because the channels may function as gutters for rain to run off and allow drying, as in many Melastomataceae. e.g. (see) Pimenta racemosa (Myrtaceae), Clidemia hirta (Melastomataceae). ^ Bagchi, Debjani; Dasgupta, Avik; Gondaliya, Amit D.; Rajput, Kishore S. (2016). “Insights from the Plant World: A Fractal Analysis Approach to Tune Mechanical Rigidity of Scaffolding Matrix in Thin Films”. Advanced Materials Research. 1141: 57–64. doi:10.4028/www.scientific.net/AMR.1141.57. ^ Clements, Edith Schwartz (1905). “The Relation of Leaf Structure to Physical Factors”. Transactions of the American Microscopical Society. 26: 19–98. doi:10.2307/3220956. JSTOR 3220956. Beach, Chandler B, ed. (1914). The new student’s reference work for teachers, students and families. Chicago: F. E. Compton and Company. Esau, Katherine (2006) . Evert, Ray F, ed. Esau’s Plant Anatomy: Meristems, Cells, and Tissues of the Plant Body: Their Structure, Function, and Development (3rd. ed.). New York: John Wiley & Sons Inc. ISBN 9780470047378. Leaf Architecture Working Group (1999). Manual of Leaf Architecture – morphological description and categorization of dicotyledonous and net-veined monocotyledonous angiosperms (PDF). Smithsonian Institution. ISBN 978-0-9677554-0-3. Verdcourt, Bernard; Bridson, Diane M. (1991). 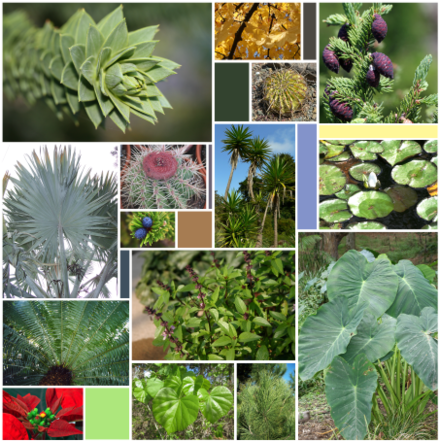 Flora of tropical East Africa – Rubiaceae Volume 3. CRC Press. ISBN 978-90-6191-357-3. Cooney-Sovetts, C.; Sattler, R. (1987). “Phylloclade development in the Asparagaceae: An example of homoeosis”. Botanical Journal of the Linnean Society. 94 (3): 327–371. doi:10.1111/j.1095-8339.1986.tb01053.x. Corson, Francis; Adda-Bedia, Mokhtar; Boudaoud, Arezki (2009). “In silico leaf venation networks: Growth and reorganization driven by mechanical forces”. Journal of Theoretical Biology (Submitted manuscript). 259 (3): 440–448. doi:10.1016/j.jtbi.2009.05.002. PMID 19446571. Cote, G. G. (2009). “Diversity and distribution of idioblasts producing calcium oxalate crystals in Dieffenbachia seguine (Araceae)”. American Journal of Botany. 96 (7): 1245–1254. doi:10.3732/ajb.0800276. PMID 21628273. Couder, Y.; Pauchard, L.; Allain, C.; Adda-Bedia, M.; Douady, S. (1 July 2002). “The leaf venation as formed in a tensorial field”. The European Physical Journal B. 28 (2): 135–138. Bibcode:2002EPJB…28..135C. doi:10.1140/epjb/e2002-00211-1. Döring, T. F; Archetti, M.; Hardie, J. (7 January 2009). “Autumn leaves seen through herbivore eyes”. Proceedings of the Royal Society B: Biological Sciences. 276 (1654): 121–127. doi:10.1098/rspb.2008.0858. PMC 2614250. PMID 18782744. Eckardt, N. A.; Baum, D. (20 July 2010). “The Podostemad Puzzle: The Evolution of Unusual Morphology in the Podostemaceae”. The Plant Cell Online. 22 (7): 2104. doi:10.1105/tpc.110.220711. PMC 2929115. PMID 20647343. Feild, T. S.; Lee, D. W.; Holbrook, N. M. (1 October 2001). “Why Leaves Turn Red in Autumn. The Role of Anthocyanins in Senescing Leaves of Red-Osier Dogwood”. Plant Physiology. 127 (2): 566–574. doi:10.1104/pp.010063. PMC 125091. PMID 11598230. Hallé, F. (1977). “The longest leaf in palms?”. Principes. 21: 18. Hickey, Leo J. (1 January 1973). “Classification of the Architecture of Dicotyledonous Leaves” (PDF). American Journal of Botany. 60 (1): 17–33. doi:10.2307/2441319. JSTOR 2441319. Hickey, Leo J.; Wolfe, Jack A. (1975). “The Bases of Angiosperm Phylogeny: Vegetative Morphology”. Annals of the Missouri Botanical Garden. 62 (3): 538. doi:10.2307/2395267. JSTOR 2395267. James, S. A.; Bell, D. T. (2000). “Influence of light availability on leaf structure and growth of two Eucalyptus globulus ssp. globulus provenances”. Tree Physiology. 20 (15): 1007–1018. doi:10.1093/treephys/20.15.1007. PMID 11305455. Lacroix, C.; Jeune, B.; Purcell-Macdonald, S. (2003). “Shoot and compound leaf comparisons in eudicots: Dynamic morphology as an alternative approach”. Botanical Journal of the Linnean Society. 143 (3): 219–230. doi:10.1046/j.1095-8339.2003.00222.x. Laguna, Maria F.; Bohn, Steffen; Jagla, Eduardo A.; Bourne, Philip E. (2008). “The Role of Elastic Stresses on Leaf Venation Morphogenesis”. PLoS Computational Biology. 4 (4): e1000055. arXiv:0705.0902. Bibcode:2008PLSCB…4E0055L. doi:10.1371/journal.pcbi.1000055. PMC 2275310. PMID 18404203. Melville, R. (November 1976). “The Terminology of Leaf Architecture”. Taxon. 25 (5/6): 549–561. doi:10.2307/1220108. JSTOR 1220108. Pedraza-Peñalosa, Paola; Salinas, Nelson R.; Wheeler, Ward C. (26 April 2013). “Venation patterns of neotropical blueberries (Vaccinieae: Ericaceae) and their phylogenetic utility” (PDF). Phytotaxa. 96 (1): 1. doi:10.11646/phytotaxa.96.1.1. Read, J.; Stokes, A. (1 October 2006). “Plant biomechanics in an ecological context”. American Journal of Botany. 93 (10): 1546–1565. doi:10.3732/ajb.93.10.1546. PMID 21642101. Rolland-Lagan, Anne-Gaëlle; Amin, Mira; Pakulska, Malgosia (January 2009). “Quantifying leaf venation patterns: two-dimensional maps”. The Plant Journal. 57 (1): 195–205. doi:10.1111/j.1365-313X.2008.03678.x. PMID 18785998. Roth-Nebelsick, A; Uhl, Dieter; Mosbrugger, Volker; Kerp, Hans (May 2001). “Evolution and Function of Leaf Venation Architecture: A Review”. Annals of Botany. 87 (5): 553–566. doi:10.1006/anbo.2001.1391. Runions, Adam; Fuhrer, Martin; Lane, Brendan; Federl, Pavol; Rolland-Lagan, Anne-Gaëlle; Prusinkiewicz, Przemyslaw (1 January 2005). “Modeling and Visualization of Leaf Venation Patterns”. ACM SIGGRAPH 2005 Papers. 24 (3): 702–711. CiteSeerX 10.1.1.102.1926. doi:10.1145/1186822.1073251. Rutishauser, R.; Sattler, R. (1997). “Expression of shoot processes in leaf development of Polemonium caeruleum“. Botanische Jahrbücher für Systematik. 119: 563–582. Sack, Lawren; Scoffoni, Christine (June 2013). “Leaf venation: structure, function, development, evolution, ecology and applications in the past, present and future”. New Phytologist. 198 (4): 983–1000. doi:10.1111/nph.12253. PMID 23600478. Shelley, A.J. ; Smith, W.K. ; Vogelmann, T.C. (1998). “Ontogenetic differences in mesophyll structure and chlorophyll distribution in Eucalyptus globulus ssp. globulus (Myrtaceae)”. American Journal of Botany. 86 (2): 198–207. doi:10.2307/2656937. JSTOR 2656937. PMID 21680359. Tsukaya, Hirokazu (January 2013). “Leaf Development”. The Arabidopsis Book. 11: e0163. doi:10.1199/tab.0163. PMC 3243299. PMID 23864837. Ueno, Osamu; Kawano, Yukiko; Wakayama, Masataka; Takeda, Tomoshiro (1 April 2006). “Leaf Vascular Systems in C3 and C4 Grasses: A Two-dimensional Analysis”. Annals of Botany. 97 (4): 611–621. doi:10.1093/aob/mcl010. PMC 2803656. PMID 16464879. Walls, R. L. (25 January 2011). “Angiosperm leaf vein patterns are linked to leaf functions in a global-scale data set”. American Journal of Botany. 98 (2): 244–253. doi:10.3732/ajb.1000154. PMID 21613113. Bucksch, Alex; Blonder, Benjamin; Price, Charles; Wing, Scott; Weitz, Joshua; Das, Abhiram (2017). “Cleared Leaf Image Database”. School of Biology, Georgia Institute of Technology. Retrieved 12 March 2017. Geneve, Robert. “Leaf” (PDF). PLS 220: Introduction to plant identification. University of Kentucky: Department of Horticulture. Hughes, Colin. “The virtual field herbarium”. Oxford University Herbaria. Retrieved 4 March 2017. Kling, Gary J.; Hayden, Laura L.; Potts, Joshua J. (2005). “Botanical terminology”. University of Illinois, Urbana-Champaign. Retrieved 7 March 2017.
de Kok, Rogier; Biffin, Ed (November 2007). “The Pea Key: An interactive key for Australian pea-flowered legumes”. Australian Pea-flowered Legume Research Group. Retrieved 9 March 2017. Kranz, Laura. “The Vein Patterns of Leaves” (Drawings). Massey, Jimmy R.; Murphy, James C. (1996). “Vascular plant systematics”. NC Botnet. University of North Carolina at Chapel Hill. Retrieved 19 January 2016. Purcell, Adam (16 January 2016). “Leaves”. Basic Biology. Adam Purcell. Retrieved 17 February 2017. Simpson, Michael G. “Plants of San Diego County, California”. College of Science, San Diego State University. Retrieved 2 March 2017. “Florissant Fossil Beds Leaf Key” (PDF). Florissant Fossil Beds National Monument. National Park Service, US Department of the Interior. Retrieved 16 February 2017. “Glossary of botanical terms”. Neotropikey. Royal Botanic Gardens, Kew. Retrieved 18 February 2017. “Plant Database”. School of Horticulture, Kwantlen Polytechnic University. 2015. Retrieved 9 March 2017.